After reading a blog post this morning about homemade protein pancake recipes, I wanted to make it on my own with my own ingredients. 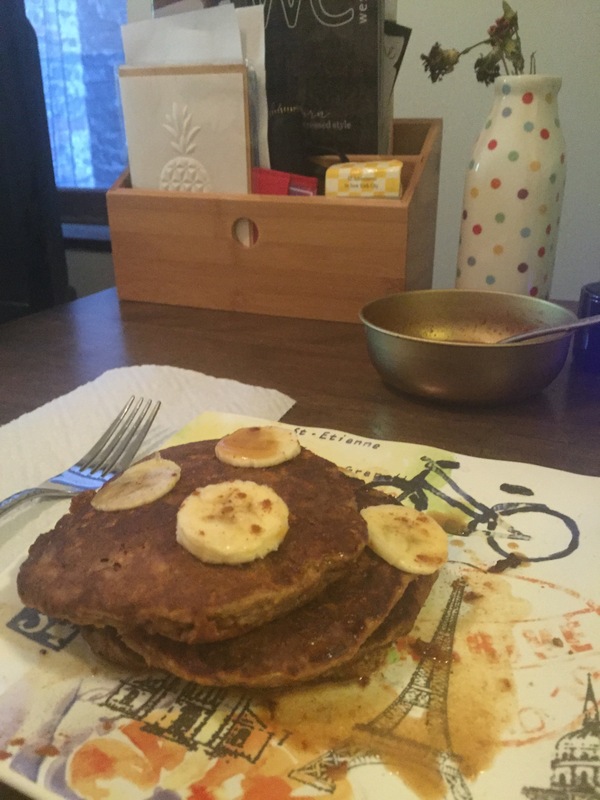 I made my variation of peanut butter banana pancakes with PB2 powdered peanut butter and a lot of other good, healthy ingredients to make them fluffy and full of flavor! These protein pancakes pack a ton of protein. I’d estimate about 30 grams of protein per serving. This makes for a delicious, filling, and decadent weekend breakfast! 1. In a small bowl, mix together maple syrup, 1 tbsp PB2, 1 tbsp almond milk for the syrup. 2. In a food processor or Nutribullet, grind the oats and almonds. 3. In a medium bowl, combine oats and almonds, protein powder, PB2, baking powder and cinnamon. Mix in the mashed bananas, egg whites and almond milk. 4. Heat a large skillet and spray with non-stick cooking spray or melt butter on the skillet. Spoon pancake mixture onto the pan. 5. Cook until desired, then flip to cook through. 6. Serve pancakes with maple peanut sauce, bananas and extra cinnamon on top! Cooked to golden brown deliciousness. Enjoy! Have you ever tried to make your own protein pancakes? These pancakes look sooo yummy! I am definitely going to make these (without the egg whites for me due to my intolerance to eggs- maybe some flax seed instead?) for breakfast over the weekend! Yes, I’m going to try to make them without the eggs whites this morning! I’d just add extra almond milk and protein powder, but flax seeds sounds like a good option too!